In every LeSS course and LeSS adoption, the question is asked how do we pay team members, Scrum Masters, and even managers. The reason why this question is always raised is due to significant reduction of organizational complexity. The number of roles, layers, positions is much less to choose from or grow towards. This seems to create some kind of communist system :-). Nothing is further from the truth. Let’s go through what is already known and described by others. Don’t rate and rank individuals. Get rid of performance reviews and merit pay. Use existing short feedback loops (instead of an annual cycle) to know how to improve as individuals. ScrumMaster plays an important role here. In the book “Scaling Lean and Agile development”, Bas and Craig give several general advices: “Avoid…Job titles”, “Try…Create only one job title”, “Try…Let people make their own titles; encourage funny titles” , “Try…(if all else fails) Generic title with levels”, “Try…Simple internal title map to special external titles”, “Avoid…Job descriptions”, “Try…Simple general job descriptions”, “Avoid…Career paths”, “Try…Job rotation”, “Try…Start people with job rotation”, etc. This overview of advices give a basis for the question on how to pay people. Teams should define their own targets and measure themselves, not management. Management should measure product performance instead of each team or individual contribution. The following is based on teaching from Bas Vodde in his course, but he cannot remember stating something similar :-). Although individual or a team performance is important, the more pressing question is whether we wish an individual to perform well now or continuously. If we wish continuous or sustainable performance then we should assess for sustainable performance. In other words, the ability of an individual to perform. Also, we should stop measuring current performance since it might have the opposite effect on a sustainable one. What does this mean concretely? Sustainable performance is a result of learning, an increase of one’s skills. In the context of Scrum and cross-functional teams, becoming multi-skilled is highly beneficial for the team and individual. This should be reflected in rewards. If the bonus is a significant percentage of yearly salary, then it barely fluctuates over the years unless the company has some financial problems. Fluctuations would seriously kill motivation and invite gaming of the bonus system. Initially, the bonus becomes an easier way for management to do salary corrections. If the bonus is a minor percentage of yearly salary, then it becomes a symbolic way to recognize the more sustainable growth and behavior of individuals. So, we start to see the trend here that already materializes in an increasing number of companies. Even banks are ditching bonuses. All major Dutch banks have already removed individual bonuses for employees. So, you would pay people more if they read more books? What if someone is making sure that he is advancing his future career by learning and getting more skills at cost of current contribution? What if someone is learning stuff and in the meantime not delivering what he is supposed to deliver? The assumption in this thinking is that there is a disconnect between becoming multi-skilled and actual delivery in this sprint. Hence the thinking that an organization must measure and reward current individual performance in addition to sustainable aspects (skills, experience). That happens indeed. It happens in dysfunctional teams and organizations that have serious problems of disengagement. One should understand and solve the root cause. Low level of engagement due to the unhealthy environment cannot be remedied with financial incentives. It could also be that an individual is simply not fit for the job, or doesn’t see the job as a chosen profession. The rest of the team (or manager if the team is unable) should fire the person in that case. Btw, hiring should be done by teams too. In the end, an individual with increased skills and experience will contribute more and have a positive impact right now too. Who and how determines skills level? The following is my interpretation of a practice I learned from Craig Larman. Introduce a scale: Developer level 1, level 2, level 3, level 4, level 5. The baseline (level 2) is the market average for let us say a C++ developer if the product is a C++ based product. Difference between levels should be significant enough since developers skills can differ significantly. Level 5 is someone who is a well-known name in the C++ worldwide community. Who and how assesses this is a very easy question to answer. If the manager doesn’t already clearly sees who is which level compared to each other, then he already is not present enough and hence doesn’t understand what is going on. This should be an easy job for a manager, and he doesn’t require any special HR process or tool. A developer doesn’t grow from one to another level suddenly. As mentioned before, the hiring process should preferably be done by teams instead of a manager. Also deciding level for a newly hired person should be quite easy for a team to do. But, since this is quite sensitive and obviously effects company cost, it should usually involve the manager. So, I got this question about what kind of principles did we follow when introducing this thing called DevOps. I have destilled the principles here. They are somewhat based / inspired by a Gavin Davies blogpost. Do 12 Agile Principles scale? Do you remember those 12 Agile principles written a loooong time ago? Well, the whole Agile thing is kind of based on them. Of course, after such a long time these could be outdated. 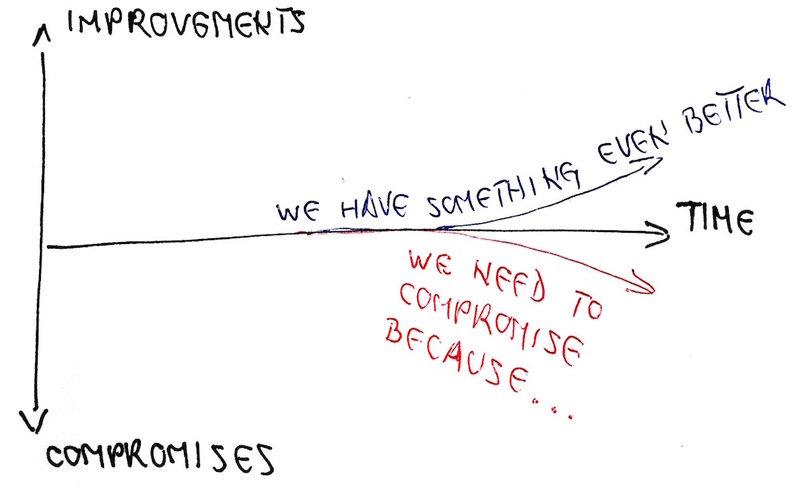 Since we love continuous improvement, the same could be applied to principles too right!? Well, a funny aspect of really good principles, is that they do not change easily. I don’t have a good reason to suggest any change. Although there are few words here and there that could be different (e.g. overemphasis of projects instead of just product development), the reason to suggest Agile principles 2.0 would be too weak. Nevertheless, a lot is written about how Agile Manifesto is outdated, something that was hot in 2001, but world has changed in last 10+ years. Therefore some improvements are suggested. So, this is all great. Good discussions. But, what really bugs me are the compromises. Scrum-but is bad. You should stick to Scrum rules, otherwise you are doing it wrong. Scrum coaches are often dogmatic. There is no right or wrong way to do Scrum. It is all about inspect and adapt, even for Scrum rules. My Scrum-but way is working very well. Scrum is a successful and widespread framework, but at some point almost everyone started to talk about scaling. Large organizations want to spread this miracle and Agilize everyone. Many consider agilizing large organisations as bad, and some say it is inevitable. In any case, opinions are often negative about “big Agile”. Naturally, this triggers negative reactions from the Agile community. Why would you want to deliver and support a product with multiple teams, when one team is so much more effective?